The city of Nanaimo is a classic West Coast community, offering natural beauty at every turn, and vast recreation potential. Nanaimo has one of the longest shorelines in Canada, and a forested mountain backdrop just outside downtown. Here, you can go from the wilderness to the city centre in just a few minutes . As the second largest city on Vancouver Island, Nanaimo promises a lively and unique urban experience. Downtown along Commercial Street, Victoria Crescent, and Fitzwilliam Street is a thriving mix of restaurants, music venues, shops, galleries, and exciting nightspots. The Vancouver Island Conference Centre, a state-of-the-art facility set in the heart of the city, is already attracting another wave of retail and service businesses that cater to visitors. Nanaimo is also home to Woodgrove Centre, the largest shopping centre on Vancouver Island. 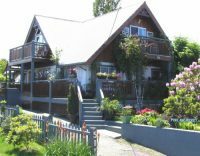 Your friendly Nanaimo Bed and Breakfast innkeepers will tell you that Nanaimo sits on the northeast coast of Vancouver Island, British Columbia, about and hour and a half north of Victoria. The town stretches out along the coast of the Strait of Georgia; it is quite pedestrian friendly and fun to visit, as many of the older buildings in town have been transformed into charming shops, cafes and restaurants. The town and its citizens have a great sense of fun, as evidenced by numerous festivals and events throughout the year. You will enjoy the Great International World Championship Bathtub Race, which takes place each summer during the Nanaimo Marine Festival. Enjoy sweet treats during the Maple Sugar Festival at the start of each year, and sing the blues at the Nanaimo Blues Festival in August. Children will be delighted by the Vancouver Island International Childrens Festival in June. And the vibrant arts and culture scene draws outstanding performers and musicians from all over the world, all year long. There are trails to just about everywhere. Start on the beach and end up on a mountain summit. Look for dozing sea lions along the rocky shore, and enjoy outstanding views from the top of Mount Benson. Play the waters in a kayak, or join up with a fishing boat charter for the day. Scuba diving off Nanaimo is some of the best in the Pacific Northwest; several sunken ships have created what is largely recognized as the World’s Largest Artificial Upright Reef. You can also use this city to do day trips to most other activities and cities on Vancouver Island. 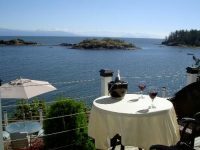 If relaxation is the goal, ask your Nanaimo Bed and Breakfast innkeeper where they best like to enjoy views of the Strait of Georgia and the mountains. It may be from their own front porch. Luxury ocean-front suites, on beautiful Hammond Bay in Nanaimo BC with a million dollar view. Ten minute walk to 2 Marine Parks! Both B&B guest suites have king beds, soaker tubs, TV, DVD, WIFI, A/C, private patios, BBQ. Relax and the Enjoy the peace and quiet on Hammond Bay! 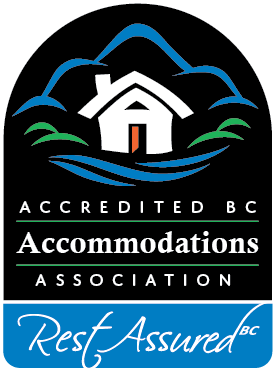 Our B&B is located close to the Nanaimo waterfront and just a short walk from the Nanaimo Departure Bay Ferry Terminal. Our balconies provide incredible views of Departure Bay and Newcastle Channel.Kayak and bicycle rentals are a block away. Your B&B host is a French Chef!